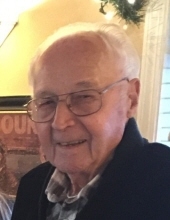 Ronald O. Jones passed away at his home July 26, 2018 in Olympia, WA at 90 years old. He was born in Tacoma, WA to Alexander and Mollie Jones. His father was from Wales and mother from Germany. His father died when he was just 4 years old. His mother raised him alone. When Ronald was 14 years old he worked for a Body & Fender Shop until he was 17. He then joined the Merchant Marines, lying about his age he served for 1 year until the war ended. He married Beverly Cornelius and had 2 children. To pay for the birth of each child, he fixed wrecked cars and sold them. He worked on the second Narrows Bridge as a Hod carrier. After that, he started working as a small engine mechanic. He then moved to Spanaway, WA and became a member of the Masonic Lodge in 1964. In 1963, he and his wife started Ron Jones Power Equipment in Spanaway. They opened the doors for business with 3 chainsaws for sale and grew from there. They would later win many awards for the number of stihl chainsaws that they sold. He retired in 1997 and turned the business over to his son Duff. During the sixties, he and his wife bought property in Hood Canal where he built their own home. In the 1980s, he and his wife moved from their home in Spanaway and remodeled a home in Olympia together. His love for old cars and restoring them continued. Ronald is preceded in death by the love of his life Beverly. He is survived by his daughter, Tamera Kerzie; son, Duff Jones; grandchildren: Kimberly Jindra, James Kerzie; aunt Ester Richie and many cousins. To send flowers or a remembrance gift to the family of Ronald O. Jones, please visit our Tribute Store. "Email Address" would like to share the life celebration of Ronald O. Jones. Click on the "link" to go to share a favorite memory or leave a condolence message for the family.